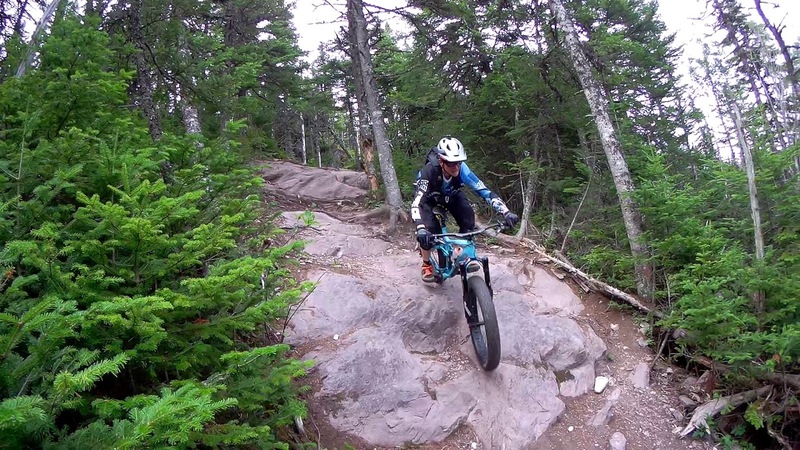 You just finished a long day at work and want to take a quick burn on your fat bike. Grabbing your bike and gear you ditch the bulky backpack - that holds your tools and spare parts - and hit the trails. Sometimes you only want to take the absolute necessities with you when going for a ride and a good way to do that is with a seat bag. 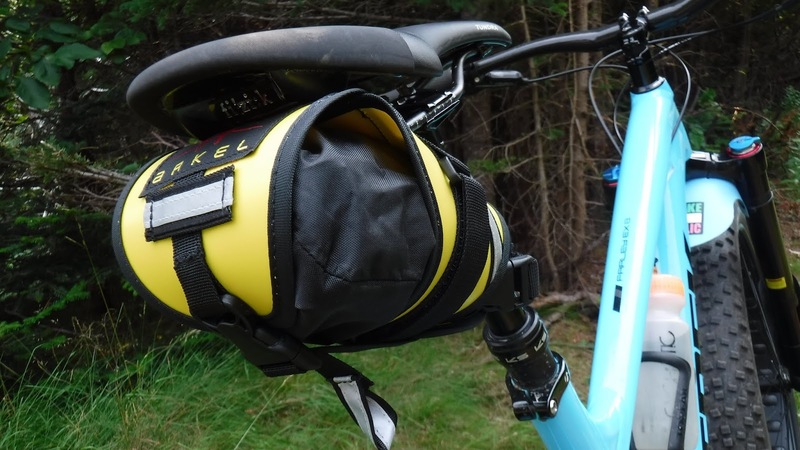 The Arkel Waterproof Seat Bag is a unique storage solution for carrying the essentials. 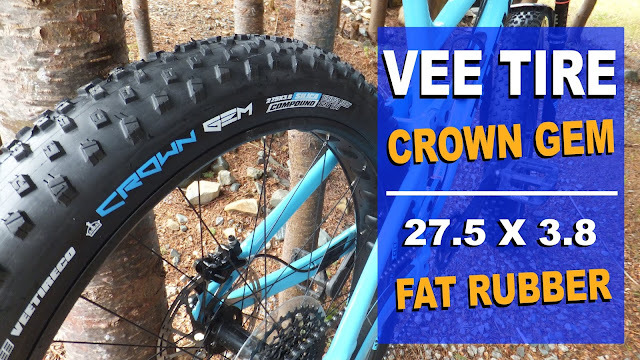 Fatbike Republic was fortunate to secure one in bright yellow for a little fat testing. There is certainly no shortage of seatbags on the internet to choose from. They are available in different shapes, sizes, hard shell, soft shell, single compartment, multi-compartment and can be manufactured from new and/or recycled material. 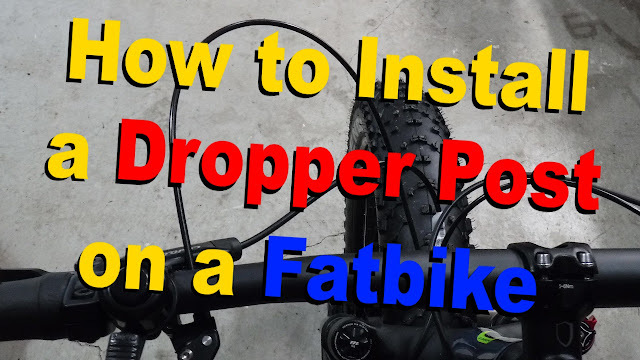 Some are even dropper post compatible. However, they all have the same goal of giving the rider convenient on bike storage. The Arkel Waterproof Seat Bag has pretty unique design with it's two piece storage system. 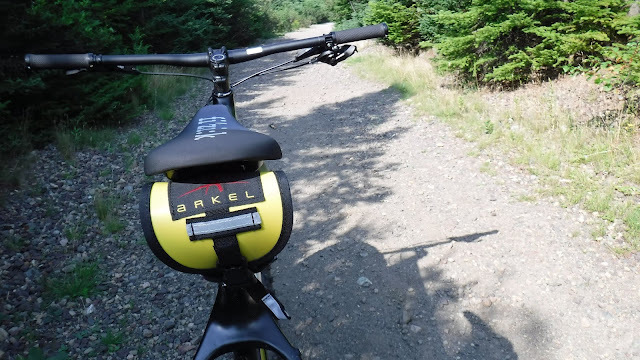 A four panel thermoplastic polymers shell (similar to flexible fat bike fender material) is permanently attached under the seat with Velcro straps. 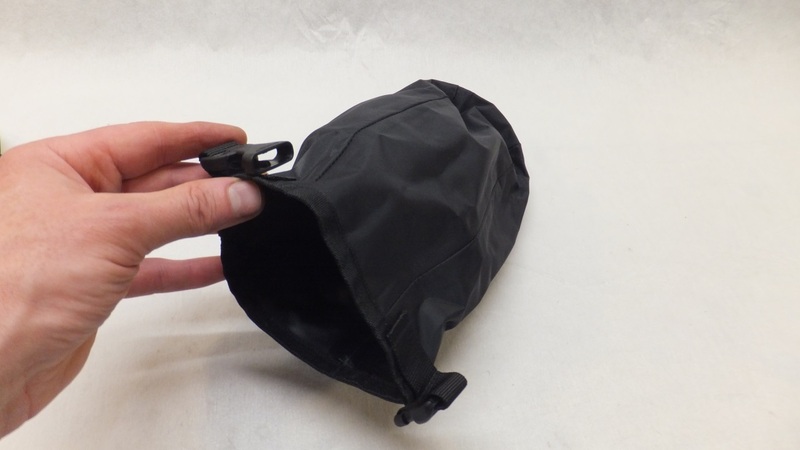 Slipping inside the shell is a waterproof roll-top thermo-guard nylon pouch that is similar to a mini dry-bag. 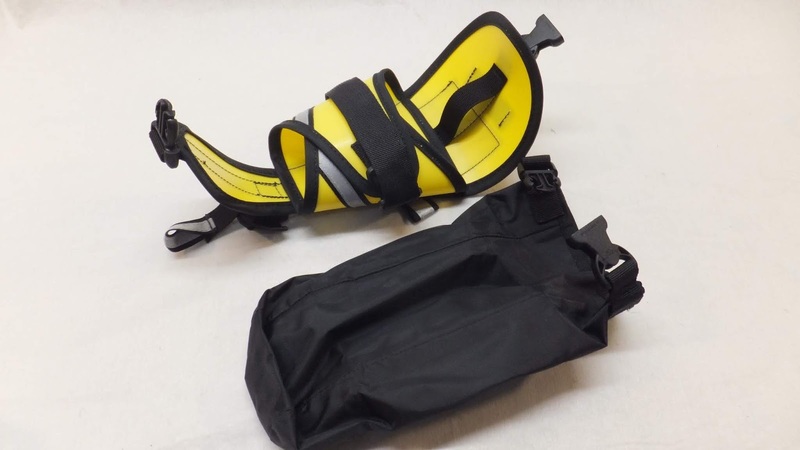 The shell is available in five colors: black, red, yellow, silver and orange. 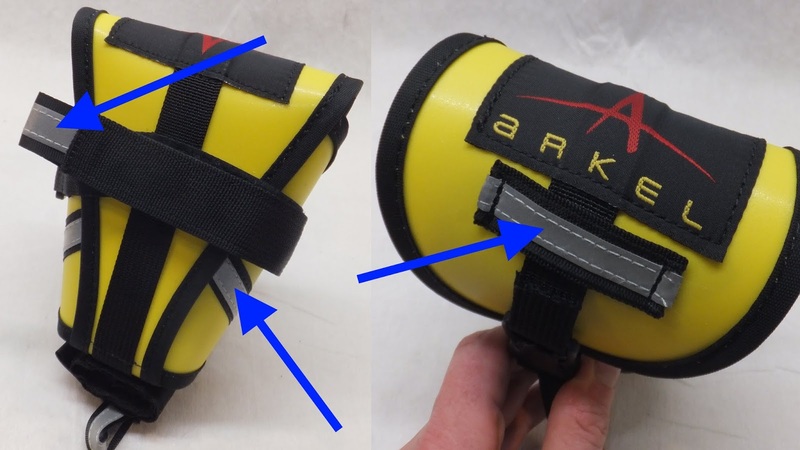 When opened and laid out flat it looks a little odd, but it has been designed to wrap around the pouch - compressing and stabilizing it - making the entire unit rock solid and rattle free. 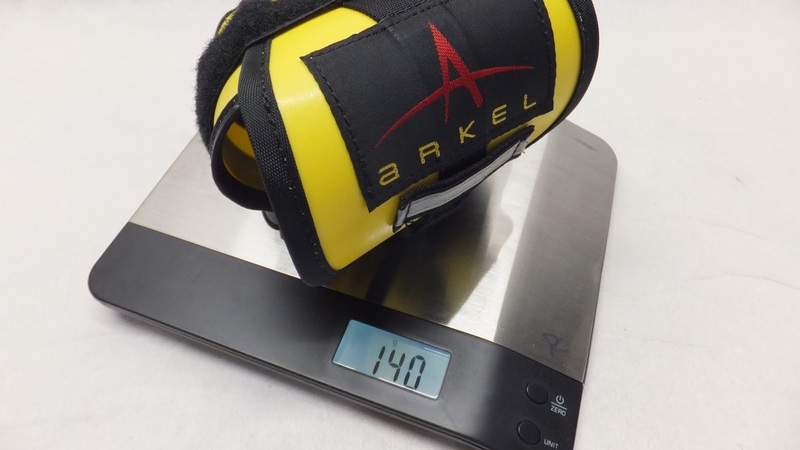 The entire package weighs in at 140g, which is rather light considering the volume of gear it can carry in the 4.25” (11 cm) by 2.25” (5.5 cm) pouch. 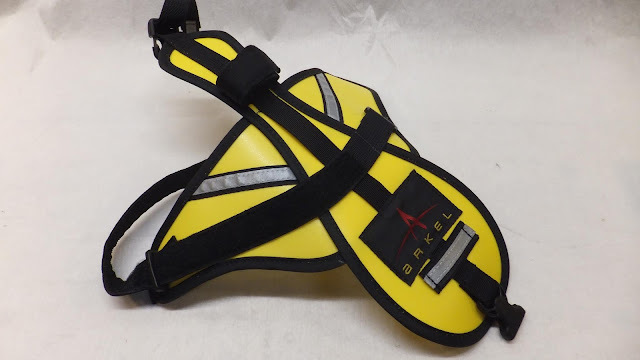 For night time visibility Arkel applied some reflective material on the rear flap, side panels and on the end of the tightening strap. The Arkel Waterproof Seat Bag does not use zippers to keep the contents secure - unlike most other seat bags. To install and secure everything there are two Velcro straps and one strap with an adjustable buckle. One Velcro strap attaches to the seat post, another to the seat rails and the adjustable buckle secures the end flap. I normally find the infographics that come with Arkel products super simple and very straight forward, but this one had me stumped. 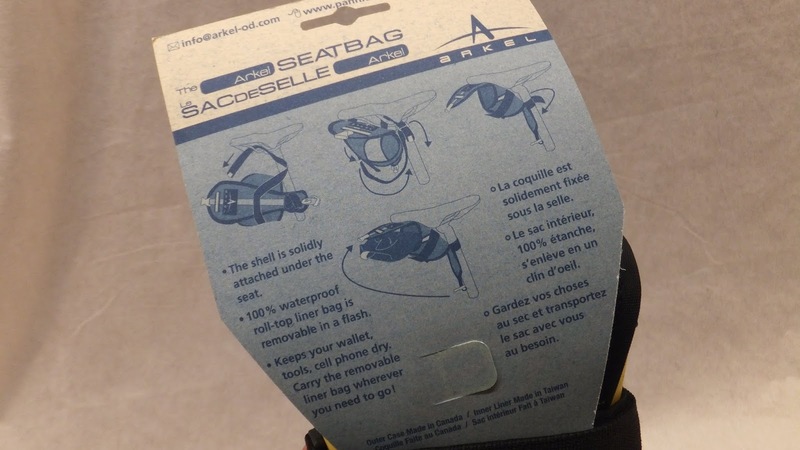 Luckily they have a super informative video on their site that explained exactly how to mount the seat bag. 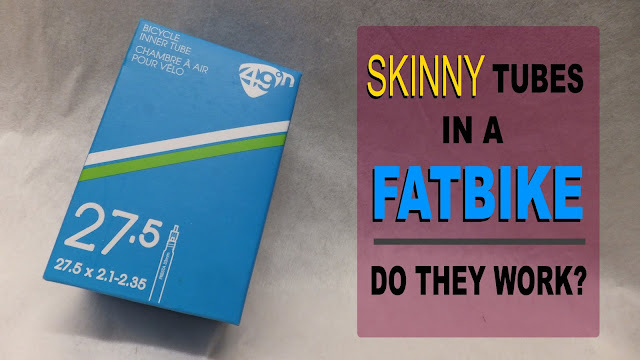 With the shell firmly attached to the seat then it’s just a matter of filling the pouch with whatever you want to carry – wallet and keys, M&Ms, or bike tools. With two turns of the pouch end - and snap of the buckle - the compartment is waterproof. 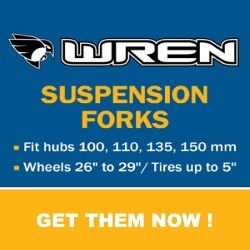 If you stuff it extra full and can only get one turn, it will be very water resistant. 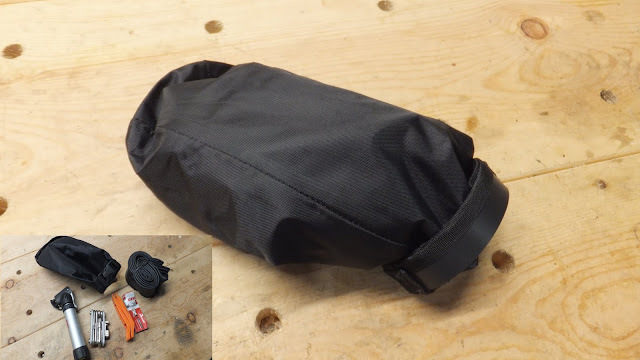 I was actually surprised at the amount of bike tools and supplies that could be squished into the pouch, and subsequently how secure the shell would hold everything in place. I managed to jam into the bag a tube, multitool, master link, tire levers and a small pump. I was successful in getting one turn on the pouch end. After mounting the shell on the Farley EX8 and securing the pouch inside the shell - which was accomplished by tugging a couple of straps and snapping a buckle - it was off to hit some serious mountain bike trails. There was zero rattling or movement of the pouch and shell. While I did not need to access the tools, I did pop open the shell just to see how easy it was to access the pouch. One press of the buckle to open the shell, and with a tug on the pouch it was in my hand. 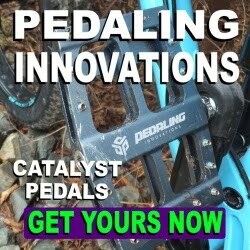 I then swapped the shell over to carbon gravel grind fatbike (Gros Louis 0) and used the same tool stuffed pouch. 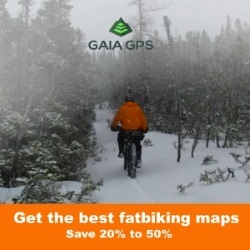 Again, it didn’t budge on the 40+ km ride on the railbed. It was tucked up and away and was not noticeable during the several hours of crank turning. 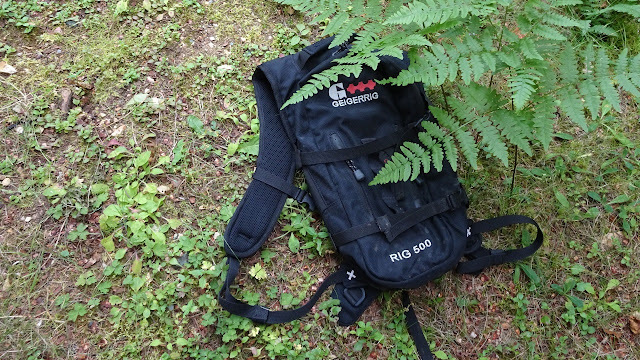 Once I figured out how to install the shell of the Waterproof Seat Bag, it was a breeze to move it from bike to bike. What would be really cool is to have several shells mounted to different bikes and just move the pouch. And with the pouch being waterproof, you should not have to worry about things getting wet no matter where or when you ride. Especially during the wet and cold slushy season. You can stuff as much or as little in the pouch and the shell will secure it in place. 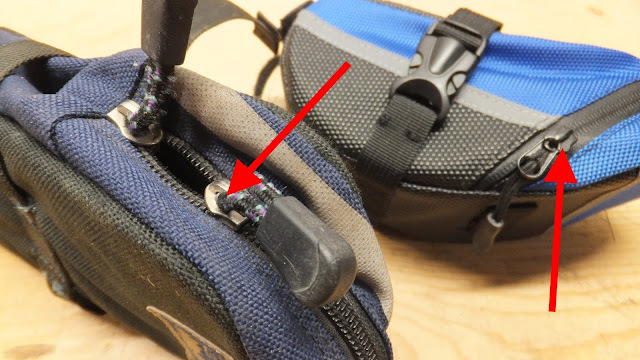 I really liked the fact that there were no zippers to rust/seize/freeze and break - yea a zipper broke while on the trail several seasons ago. That was frustrating! Being able to remove the pouch enables you to dump the contents on the ground instead of fishing around in crevasses. And if you re-stuff the pouch differently, the shell will conform to the new shape. No wrestling trying to repack the seat bag on the trail. 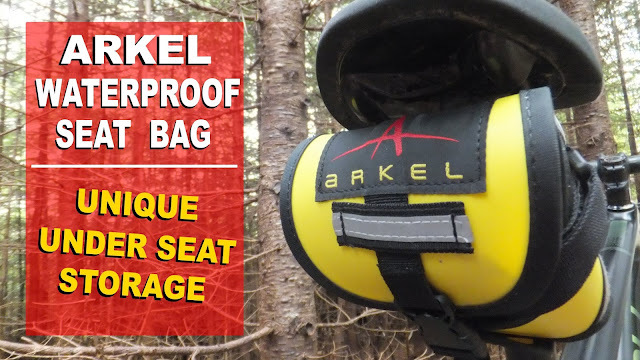 While the design of the Arkel Waterproof Seat Bag is a little unorthodox, it really does work. Thanks for the great tips! Love your work.